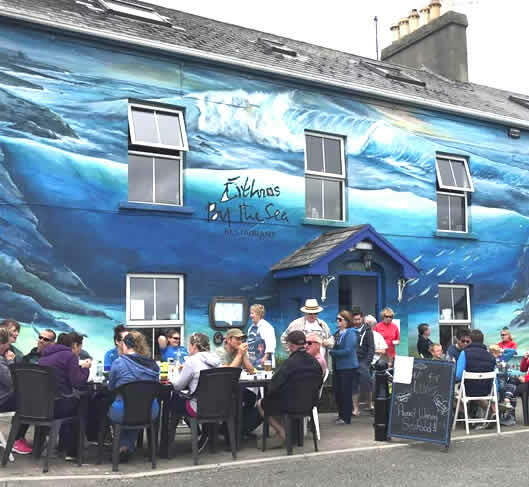 Arriving into Mullaghmore, a charming coastal village, a signature destination point on the Wild Atlantic Way, you cannot fail to see Eithna’s by the Sea building with its dramatically painted sea mural of Mullaghmore above and below the sea, an impressive village landmark. Eithna’s by the Sea is proud to share delicious bounty from above and beneath the waves. From the shoreline to the shore, you will find the very best fish, shellfish and seaweeds, accompanied by locally grown organic vegetables. Eithna enthusiastically creates tasty nutritious dishes using only the finest raw ingredients at their seasonal best. Mullaghmore Lobster features highly on the Menu, not alone because it is sourced from the next door Lobster Pond, providing her with a regular supply of locally hand harvested sustainable Lobsters and Crab; dishes like lobster Thermidor/Garlic and a unique green Curry being one of her most popular Lobster signature dishes. 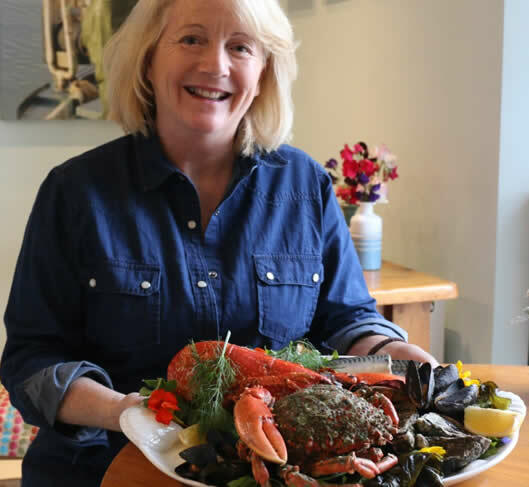 Try her most tempting seafood platter, which will keep you cracking – break through the mountains of crab claws in the shell, fresh Donegal Bay Prawns in season and the succulent flavours of just cooked lobsters and you are hooked. 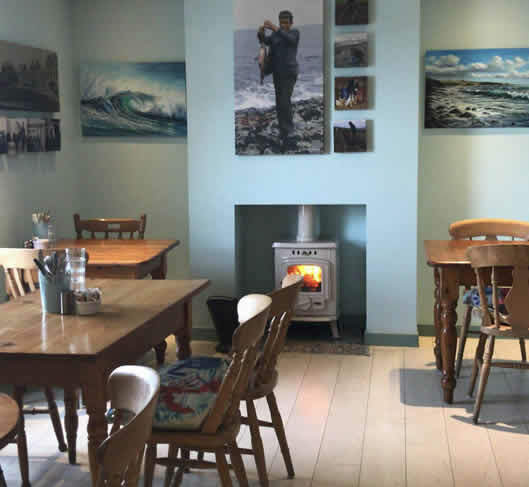 Seaweed and sea vegetables are an integral part of the menu, featuring in breads, desserts , seafood dishes and in the range of Eithna’s homemade Wild Atlantic seaweed pestos. 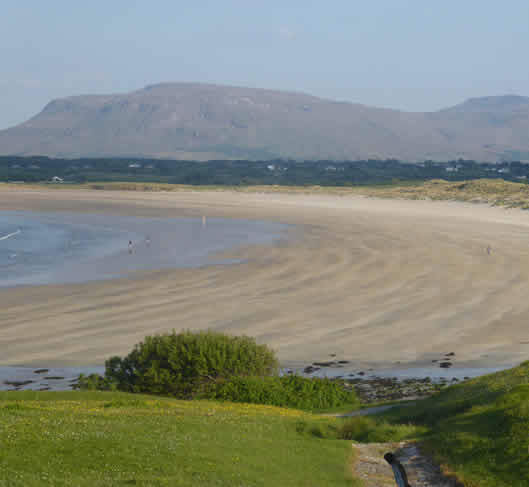 Beef and lamb are raised on local pastures with their own distinctive flavours from the mix of wild herbs and grasses that abound close to the shore. Eithna can also provide variations of wholesome vegetarian dishes effortlessly as an addition to her daily menu. Many people return again and again, so to get a Berth in this wonderful homely local business, it’s best to reserve a cabin space! 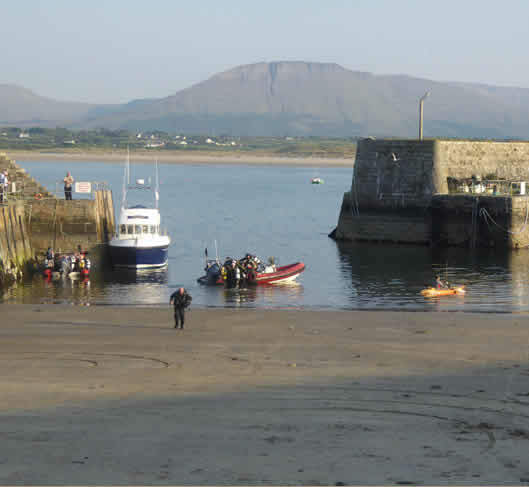 Fishing is integral to village life along this Donegal Coast. 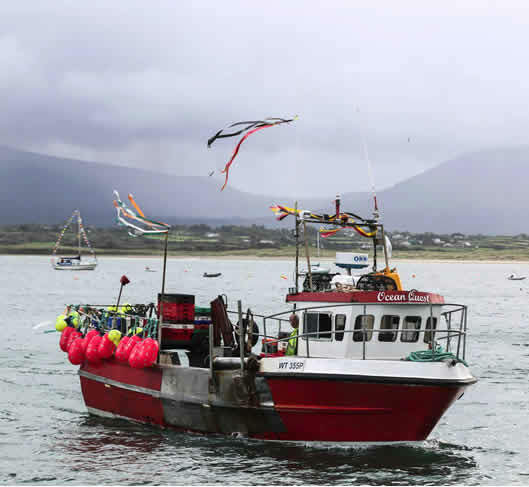 Boats come and go along the miles of rugged coastline arriving in with hauls of fish – amongst them favourites include mackerel, mullet, cod, crab, squid and lobster. 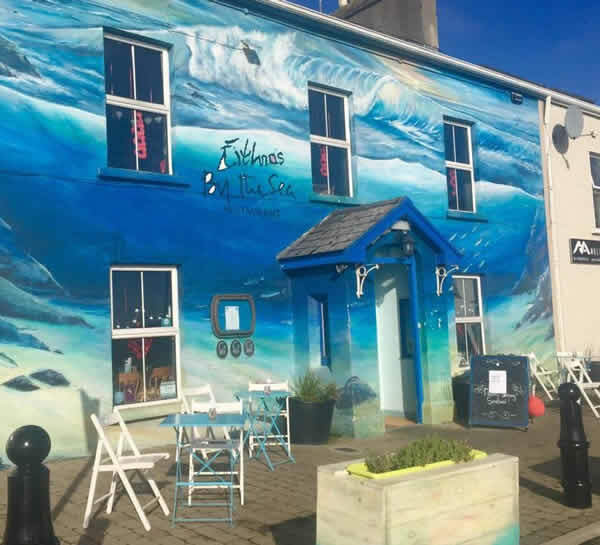 Step into the restaurant and history reminds you of Mullaghmore bygone days with walls decked with photographs of past local customs and characters that once were part of the way of life of this fishing village. When the sun shines, as it does sometimes (! ), you can dine al fresco, with a glass of chilled white wine, whilst overlooking the bustling harbour; a hive of activity in summer months, alive with the activity of sailing dinghies, stand up paddling, kayaks, horse-riders and divers, before heading off to explore hidden gems in the ocean. Others choose to take in the sea-air with a stroll along the harbour, watching the activity of fishing boats and yachts gracefully weaving along the horizon. Venture down onto the beach when the tide rolls out and admire an amazing garden of seaweed or find yourself wandering along the grassy trails behind the dunes and delight in a paradise of unexpected orchids and a profusion of wildflowers..